On a frosty January morning in 1973, I packed my belongings, such as they were, in the back of my old truck, rolled down the driveway, popped the clutch, and drove slowly away from my temporary home in a former schoolhouse in Mainland, Pennsylvania. Away from my cousin and his big white dog and away from my old life, with little more than a smile and a wave goodbye. I was headed east, to Brooklyn, New York to find someone I knew was waiting for me there—myself. In a few hours I had gotten as far as the Lincoln Tunnel. I paid the toll and followed the cars in front of me into a dark hole in the rock. Traffic in the tunnel was moving along nicely. I got in the fast lane and stayed there like the sign said. Cars passed me on the right. Now and then a driver would glance over his left shoulder to see what kind of moron would be driving such an old truck into Manhattan. Under the river we were. I hoped there was more than dirt and ten million white tiles holding back all that water. Down and down we went, then, heading back up again, a twist and a turn and to my great relief, I sensed light ahead. We must be nearing New York. Suddenly, there were different lights. Many lights–all of them red. They were on the backs of the cars that were slowing down… and then stopping… as we got near the tunnel’s end. I slowed down too, and I came to a stop, just as my new life was set to begin. I was still well inside the tunnel. I glanced at the temperature gauge. The needle was well over to the right, indicating HOT. I had replaced the radiator fan not long before, but I was more than a little worried about the engine overheating. So I did what I thought was the sensible thing, I cut off the engine. We were stopped, after all, and who knew for how long? No point in wasting gas. I sat there for a minute or two thinking about I don’t remember what– and then slowly… the tail lights on the several hundred cars in front of me flickered off and on then off again– and traffic started slowly moving. I pressed the little chrome starter button on the dashboard and the engine turned over nicely, but would not start. “UHHNNHHH-RRR-RRRUH….RRUHHH….” she told me. I pumped the floating gas pedal and held the button down–a little more panicked now…. I tried not to flood the carburetor. Behind me, horns began honking. They were not friendly honks. 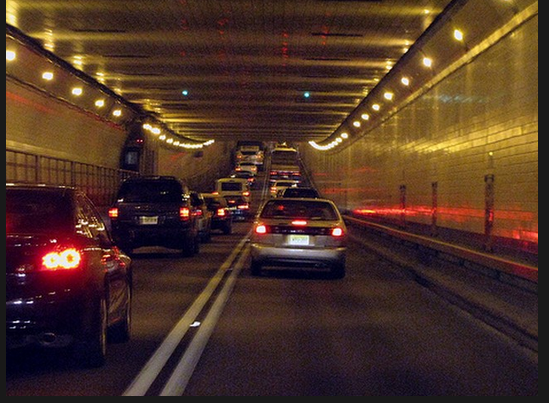 Soon hundreds of horns were honking all the way back through the tunnel to Weehawken, New Jersey and echoing through the tunnel and up toward me. It sounded like some kind of celebration. I wanted to join in, but, of course, I realized they were all honking at me. I had come to New York to get attention, but this was not the kind of attention I sought. Thankfully, after the angry horns were playing a murderous symphony in my head, the old 100 horsepower flathead V-8 engine started. I shifted into first gear– and then second– and in a minute or two, I emerged into the late afternoon sunlight. But I had arrived—and to a tumultuous and shouting welcome from my fellow New Yorkers!